Director Robert Hendrickson was one of the directors of 1973's MANSON. He runs the Exclusive Film Network that seems to be all things Manson related. 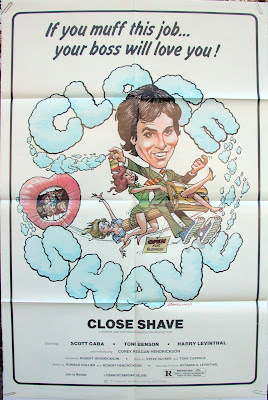 He may have a print of CLOSE SHAVE still lying around. As soon as Mr. Hendrickson finishes the MANSON book, he is planning on doing something with CLOSE SHAVE. Thank you for your interest in our films. I wouldn't count on getting much out of him. Robert Hendrickson is my uncle and he's basically a recluse still trying to ride the waning wave of his Manson work. I was curious about this movie myself but it seems like no one has seen it and probably for good reason. There's a new blog in town... SCHLOCKMANIA! "'Grand Old Lady' Turns to Kung Fu for Survival"
More DVDs coming soon from Cultra!